Go East, Poet, Go East! 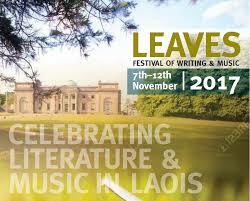 I’m heading across the Shannon, to Emo Court in Co. Laois, to take part in this lovely festival. I’ll be reading with Denise Curtin and Paddy Moran, and there’ll be music from Gary Dunne. Seamus Hosey will be putting manners on us all. So, if you’re around the Laois area next Saturday, join us at 3pm in the Drawing Room. Such a treat to be reading in a building as magnificent as Emo Court. Thanks to Muireann Ní Chonaill, Laois Arts Officer, for the invitation, and to the OPW for letting poets run loose in the place! There’s lots of music over the weekend. There’s poetry on Friday from Jean O’Brien, Helen Ivory & Martin Figura, and on Saturday evening Kevin Barry & Lisa Harding will be chatting to Seán Rocks. You can view the full programme at http://www.laois.ie – Arts Office. Booking is on http://www.dunmaise.ie – Dunmaise Arts Centre, Portlaoise.